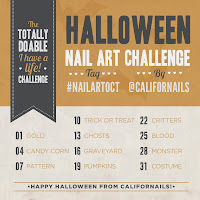 Californails: #NailartOct Challenge: Halloween Edition! October is coming! I am so excited for fall manicures this year. Just to go over the rules for these challenges again... there are none! It's okay if you're a bit late and it's okay if you skip a few days. 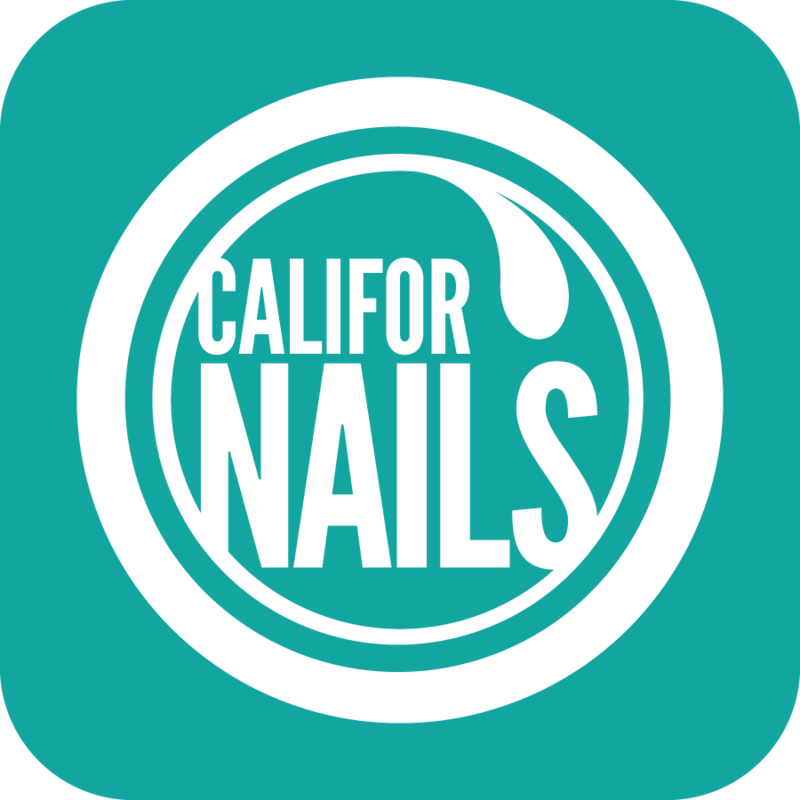 These are solely created to give inspiration, to participate in the nail community, and have fun. It isn't a contest with prizes, just for fun and inspiration. Anyways, I know some people go all out all month with Halloween stuff from the very start but I left the themes open so that if you don't want to go all out for Halloween just yet, you don't have to. But if you want to, you still can! The themes in this challenge are pretty self-explanatory but I thought it'd be good to go a few that might be a bit confusing since there is always some confusion. This mani can be all gold or just accented with gold. I thought it would be a good color for the beginning of October since it's very fall-ish. This is slightly more Halloweenie at the start of the month than I thought but I realized people are starting to eat candy corn now so it's all good. Incorporate this fun little candy into your mani! This can be a pattern of anything. It can be for fall, Halloween or even just stripes and polka dots. Anything having to do with trick or treating! 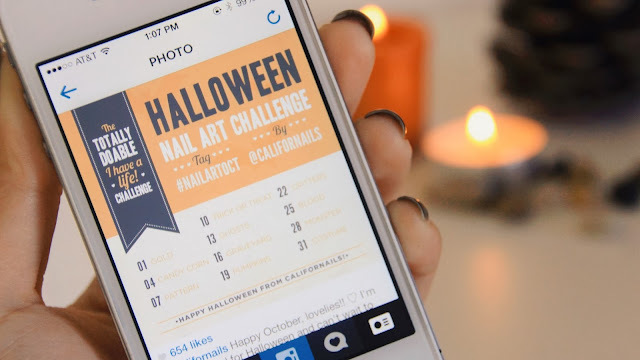 Candy, costumes, trick or treat bags, maybe even mani inspired by the time of day most people go trick or treating. It's up to you. Critters are usually small animals. You may do whatever you like or go the Halloween route. Think of all the creepy crawlies you may find on a spooky Halloween night. So there it is! 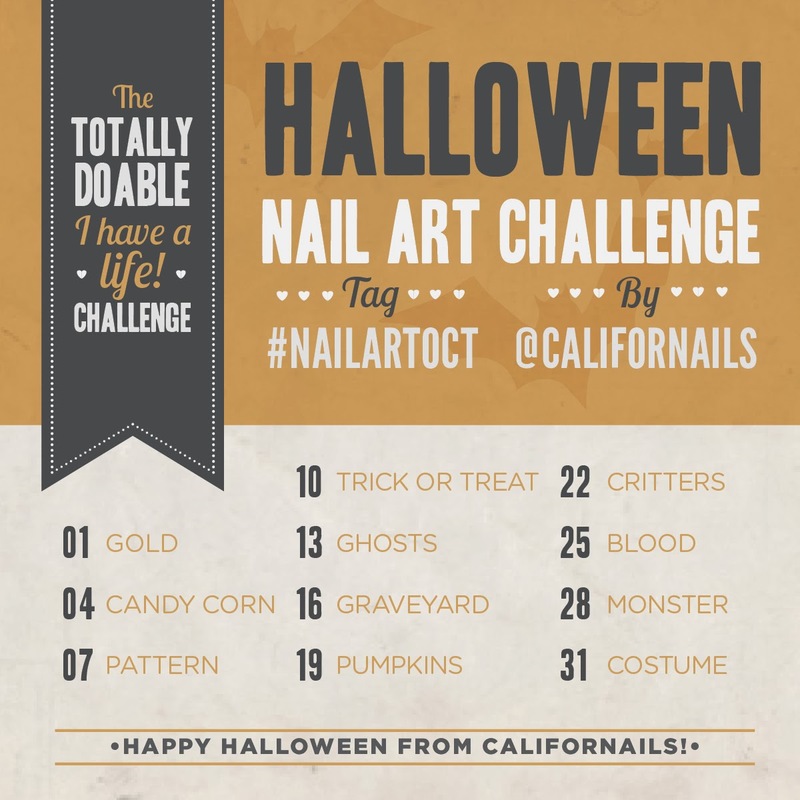 If you'd like to participate, you can click to enlarge the challenge and post it to your blog or Instagram. Basically, just have fun with it. I think I'm going to start posting some of my favorites onto my blog each week. I love looking through the monthly challenge tags and want to show your them off to the world :) So many of you deserve it!